Plumbing leaks can often go unnoticed and cause water damage and mold. 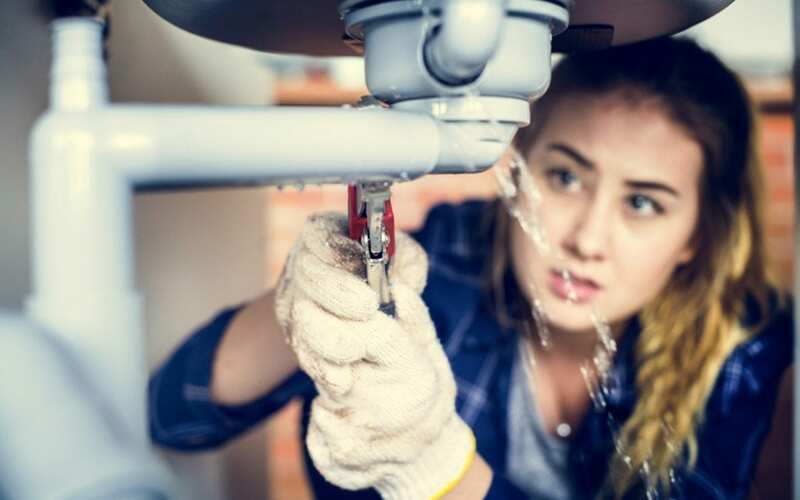 Many homeowners aren’t aware of plumbing leaks until they see their water bill has skyrocketed. However, there are ways of preventing household plumbing leaks that will save you trouble and money in the long run. Water pressure is the force with which water rushes through the pipes. We’ve all tried to wash our hands and wondered why only a trickle came out of the faucet. If the water pressure is lower than the recommended setting, then it will take longer and more water to wash your hands or take a shower. Water pressure higher than what is recommended could strain or burst your pipes. One of the ways of preventing household plumbing leaks is to invest in a water pressure gauge. They are available at big box stores and hardware stores. Make sure it has a female water hose coupling. Locate your main water supply. It should be close to the water heater. A meter will be attached to the pipe. The connection could also be outside. If you live in a warm climate, look outside near the road. It will be covered with a heavy metal lid. Turn off the main water supply. Tell anyone in the house not to use the water while you test it. Turn on the water full force. The reading will tell you the water pressure. Recommended water pressure is around 45 psi. If the pressure is higher than this, then use a water pressure regulator to bring it down to normal levels. Most washing machines have a pan beneath them. If yours doesn’t, you could have water puddling on the laundry room floor. Another way of preventing household plumbing leaks is to check the hoses. First, begin filling the tub and then pull the machine away from the wall to see if water drips from the hose. If you see that water is dripping during this test, then you need to replace the hoses. If the hose isn’t the problem but it’s still leaking, you’ll need to call a professional to check inside the machine. It could be anything from the pump to the pump hose. There are numerous smart leak detection units that you can buy online or in big box stores and hardware stores. They work by detecting leaks and then notifying your smartphone. You can set some of them up to shut off the water when a leak is detected. Some are battery operated. Their batteries will need recharging once a year. Others plugin, but these are difficult to place around potential leaks due to the distance to an electrical outlet. While both do a good job, they do a better job when hooked into smart home integrations like Google Home. Homeowners rarely think about preventing household plumbing leaks until brown rings appear on ceilings or they step in a puddle. Early detection is the key to avoiding costly repair bills for plumbing and water damage. Republic Home Inspections provides home inspection services to Las Vegas and the surrounding areas. Contact us to book our services.